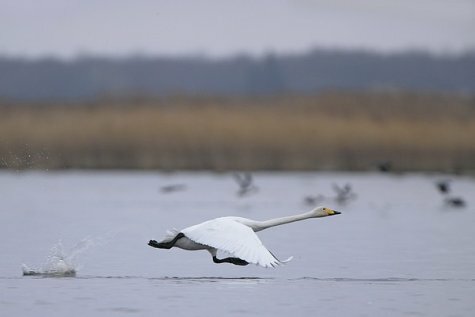 Nesting of the first whooper swan pairs in Estonia was observed in 1979, at Lavasaare lake. Today we already talk with certainty of 100 nesting pairs. This magnificent bird is often confused with the somewhat smaller but very similar Bewick’s swan. The whooper swan is bigger, with a longer neck and a more yellow beak. It must be admitted that only an experienced observer can distinguish between them quickly and seen from a distance. The whooper swan migrants arrived to Estonia earlier than the Bewick’s swans – after all the latter have a longer distance to cover. They are often together in mixed flocks. The story of the Finnish national bird during the previous century is this: swans were prey for hunters and were almost completely annihilated in the middle of the century. It is estimated that only 150 whooper swan pairs nested in northern Finland. In the 1950ies the general attitude of society changed and swans began to be protected. Slowly numbers started to recover, reaching 1 500 pairs in 1990; today nearly 7000 pairs nest in the whole of Finland. The birds, earlier only encountered in tundra areas, now nest down to the southern coast. A quite good photo by Arne for comparing whooper and Bewick’s swans. The differences are really very small.